The Commissioner, also known as J. Jonah Jameson, is back tonight with another terrific guest review - take it away Jason! Tonight I’m going to review three figures from a new line of Disney action figures done in a style first established some years ago by Fisher Price’s Rescue Heroes. They’re called Disney Adventurers, they’re Disney Store exclusives and if I get my wish upon a star, they’ll be around for a long time to come. Hasbro currently holds the Disney toy license, but I saw no indication on packaging or figures that these are their work. This first wave consists of four Disney Heroes (Aladdin, Hercules, Peter Pan & Tarzan) and one Villain (Captain Hook). This review will cover Pan, Hook and Tarzan. I’m a big fan of individualized cardbacks and these are that…on one side of the card anyway. The card has a nice drawing of the enclosed character and the blister features the character’s name. The Disney Adventurers logo, which I like a lot, is reprinted on the back with a passage of text that suggests these Adventurers are something of a superhero team (that codfish Hook excluded, I would assume). These also have individualized embossing on the blisters, which is pretty unique among basic figures. Tarzan features a spearhead, Pan a ship’s wheel and Hook a skull and crossbones. A really nice touch, if you ask me. Especially for MOC collectors. If you’re not a fan of the Rescue Heroes style, you won’t feel the same way I do about these guys. But as a huge fan of RH style figures, these are fantastic in that they fit the style while maintaining all the essentials of each character (and therefore the respective styles of the movies they represent). They all have the big feet, big hands and same relative build, but Tarzan is still buff and sinewy, Pan is still an elven sprite and Hook is still a foppish menace. The head sculpts in particular are spot-on, capturing the signature expression and emotion of each character perfectly. Hook also stands out for the detailing on his overcoat. From what I saw in the store, Aladdin and especially Hercules are just as well sculpted and accurate as the three figures reviewed here. Overall an excellent job on all three figures, basically nothing in the way of bleed or messiness. The only negative would be the paint on Pan’s shoulders, which is a tad gloppy, but it doesn’t stand out too badly. Tarzan being, well…Tarzan, doesn’t have much in the way of paint ops, but where it counts, in those steely eyes, it’s a homerun. Peter Pan has neck, shoulders, elbows, wrists, waist and v-hips. Captain Hook has shoulders, elbows, wrists, waist and knees twists. Tarzan has neck, shoulders, elbows, waist and v-hips. Pretty standard articulation for figures of this style and the range of motion of the elbow articulation here is far better than that of the Spider-Man & Friends figures. I don’t know why Tarzan doesn’t have wrist articulation and Hook’s neck joint is totally blocked by his hair, those are the negatives. However, all figures have a spring-loaded waist ala the old Masters of the Universe figures. Twist waist for Power Punch, baby! This is where these things just shine, both literally and figuratively. We get completely character-appropriate accessories for each figure. Tarzan comes with a beautifully sculpted, stone-headed spear and an equally well-rendered vine. The vine has a large suction cup at one end and a small loop for Tarzan’s thumb or big toe at the other. The cup sticks well and Tarzan has no trouble hanging onto the vine. Also, Tarzan’s right fist has a spring in it for a pull-back-and-launch spear throwing action. It doesn’t work particularly well, but hey, it’s there. A lever on Tarzan’s back moves his right arm for fighting action. 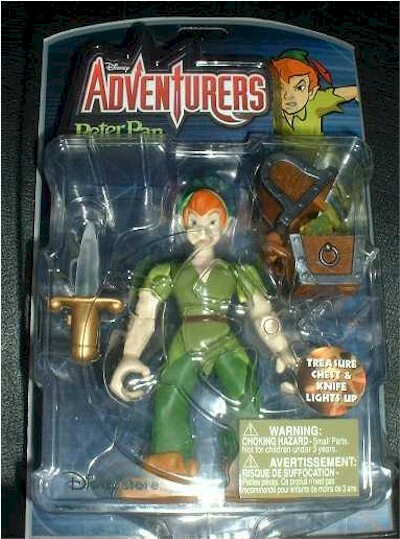 Peter Pan comes with a dagger that lights up and an opening treasure chest that lights up AND has sound. The orange light thrown off by the dagger is quite formidable and fills the length of the blade. The sculpting on the knotted wooden exterior of the treasure chest is fantastic; as is the clear, yellow sculpt of the treasure inside. When you open the chest, the treasure light flashes and you’re greeted with a “Brrriiinnngg!” sound. Too cute. On Peter’s back are two levers. One operates his right arm and the other moves both arms at once. Using them in combination you can create some pretty cool dueling moves. All the accessories are well made and all the lever-activated actions work smoothly and solidly. Just a great job all around. These were $8.50 each at The Disney Store, where they are exclusives. That’s only slightly more than you’d pay at TRU for a Rescue Hero, Transformers Go-Bot or a Spider-Man & Friends figure and here you’re getting action features and light and sound accessories in addition to the terrific sculpts. To me they were easily worth the money, I’d have probably paid a bit more for them in fact. If you’re not a fan of this style figure $8.50 may seem like a bit much, but in the age of $7 for Justice League figures, I think Disney Adventurers are a very good deal. As I’ve said throughout the review, if you’re a fan of this style of figures, these are fantastic. I also think they’re the best action figure representations of these characters ever done and that goes for Aladdin and Hercules (who will both soon be mine) too. It seems Disney Adventurers is going to be a brand Disney puts some considerable effort into as there is also a 12” line of figures (same characters as these smaller figures) as well as a line of cup sets, mugs, towels and the like to go along with the toys. This bodes well for me because I can’t wait to see this line build and expand to include other Disney Heroes and Villains. Jafar, Clayton, Hades, Jim Hawkins, Long John Silver, Quasimodo, Phoebus and Frollo would all be welcome, you ask me. And for Walt’s sake, let’s get The Beast and Gaston made in this line PRONTO. I’d go absolutely berserk for a Gaston figure done in this style. Say is with me now…these are Disney Store Exclusives. However, if there isn’t a Disney Store near you, DisneyStore.com is also carrying them. Figure from the collection of Jason Chirevas.